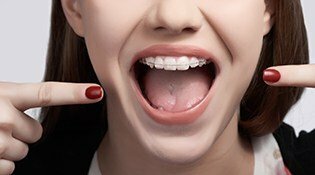 The term “braces” was first coined in the early 1900s, and ever since then, countless patients of all ages have been relying on this time-tested system to straighten their teeth, improve their bite, and smile with more confidence than ever before. At Cartwright Orthodontics, patients pursue either metal braces or ceramic (tooth-colored) braces with Dr. Gary Cartwright’s experienced, friendly guidance – and our dedicated team members will provide plenty of support as well! Contact either our Bethel Park office or our McMurray office today to schedule your first consultation. 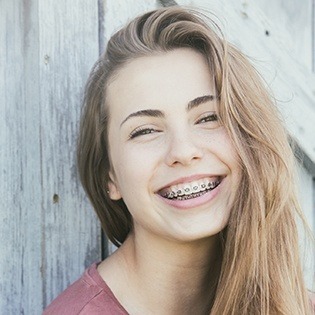 Metal braces are the most common type of orthodontic treatment. Today’s metal braces are smaller, more comfortable, and more attractive than ever before. They consist of metal brackets made of high-grade stainless steel that is bonded to the facial side of teeth, usually along both the upper and lower arches, as well an archwire. This thin archwire is clipped into the brackets and runs along your entire arch in order to put pressure on your teeth. Elastic rings, also called o-rings or donuts, secure the archwire to the brackets. To anchor the archwire, bands or metal rings are usually placed around your back teeth. Together, these materials work to move your teeth up or down and side-to-side to give you the straight smile. Ceramic braces are made of translucent material. They are most popular with adult patients and teens due to their cosmetic appeal. The only drawback to ceramic braces is that they are more fragile and a little larger than traditional metal brackets. Another consideration when you’re deciding what type of braces to wear is cost. Ceramic braces are typically more expensive than metal braces.